If you're like me, sometimes Brussel sprouts are just about the best vegetable out there. Something about the nutty flavor that, when cooked right, just melts in your mouth. I was inspired by a recipe from Lauren of Perpetually Chic on Jen's blog called Fall Harvest Salad but I skipped the squash and romaine and just went for the full on sproutage (ok, yes, I made up that word). It's a hit. For you new cooks - just make sure you don't cook the Brussel sprouts for too long or they will get bitter very quickly. Try to find young, small sprouts since they are much more tender and soften easier. In a skillet over medium heat, saute the sprouts with about 1/2 Tbs butter and turn continuously until they just caramelize on the outside. Remove from heat and allow to cool (refrigerate them). Mix the dressing - oil, salt, vinegar and agave - in a bowl with a whisk. 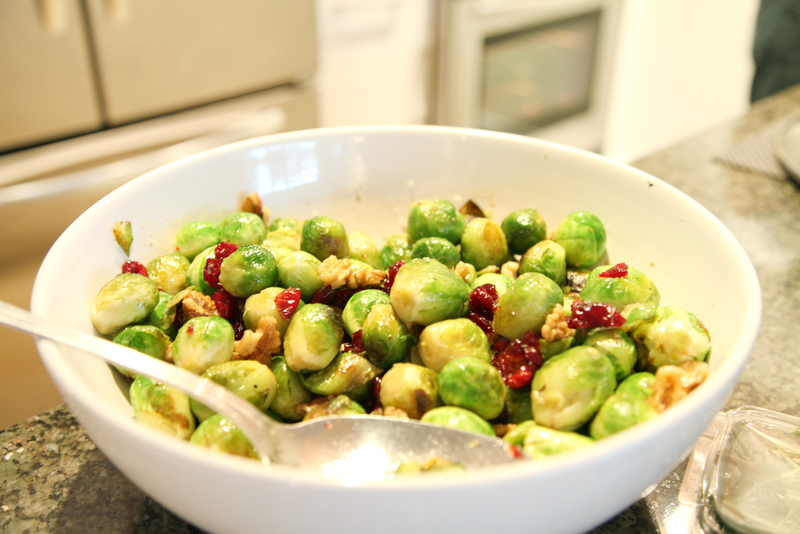 Toss the sprouts, cherries and walnuts with the dressing, then put into a clean bowl and crumble the top with blue cheese (not shown in photo). ** For this I used 3 bags of the easy microwave ones but took them out of the bag since they were already trimmed. If the sprouts are large, halve them. As a fellow Brussel sprouts lover, I'm all for full on "sproutage" too! Thanks, Mat! Haha I was going to comment on the sproutage but I see Lauren has beat me to it. I'm not a big fan of blue cheese thought, think it will be just as good without? Or is there something else you recommend I add - I'm not a big cheese person. There's all kinds of good replacements though IMO a good blue cheese or gorgonzola work best. You might consider a crumbly goat cheese or even a feta - it's that half-creamy consistency and pungency that work with the dish. Queso blanco would also work but might be a bit too light. Or if you don't like soft cheeses, you might even consider cubed, smoked gouda. Thanks for all the recommendations! Can't wait to try this recipe.